CT.: Maurizio Martino, 1999. 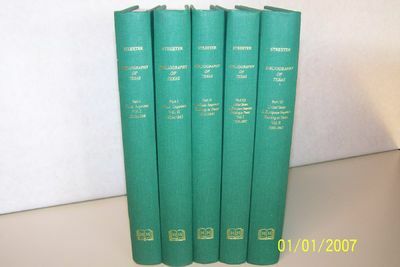 Bibliography of Texas 1795-1845 by Streeter. One of only 150 sets printed. A facsimile edition of the original Harvard publication (1955-60). The Streeter bibliography is not only the most important bibliography on Texas related imprints but, a monumental work on a single region of the United States. Contains Texas imprints from 1817 to 1845, Mexican imprints relative to Texas: 1803 - 1845, and American and European material relative to Texas from 1795 to 1845. 1,631 consecutive entries with facsimile images. An absolute must for a Texas collection. Streeter, Thomas W. (Thomas Winthrop), 1883-1965. BIBLIOGRAPHY OF TEXAS, 1795-1845. / BY THOMAS W. STREETER. Mansfield Centre, CT: Martino Fine Books . 5 volumes, complete. 8vo. lxxi,260; [iv],261- 616; xxiv,283; xlii,278; [iv],279-677pp. Original green cloth with gilt lettered spines. In fine condition. Provenance: Estate of Russell Johanson, Ravenna Rare Books, Seattle, Wa. We ship most items in-house with the exception of furniture, large or heavy artwork, heavier items or extremely fragile items. . Limited Edition. hardcovers. near Fine/No Jackets. 7¾" - 9¾" Tall. scarce Texas History.